A favorite of winemaker Lee Lutes, this dry red is dynamic with many nuances. It is elegant on the palate and complements a variety of cuisine choices. flavors of dark cherries, currants and complementary oak in the finish. Proper cellaring will reward the patient in ten plus years. Pinot Noir tends to be one of the most versatile red wines and is often a wonderful addition to many meals. Some of our recommendations include: grilled meats such as pork or lamb, artisan-made pizza, beef fajitas, grilled salmon or pepper crusted tuna steaks. Pinot Noir is the most prolific red wine grape we grow and bottle. We have been committed to making the northwest Michigan version of this variety since day one. Five different vineyard sites provide us with fruit. 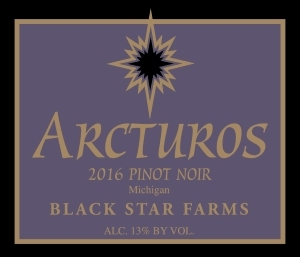 This makes us able to be selective with what we produce.The Arcturos brand of this wine is meant to be our front line Pinot Noir. There is a balance of vibrant fruit and spicy complexity that comes from time in the barrel. Oak used for this bottling is mostly older, 100% French and is roughly 10-15% new. If you are looking to try a Michigan version of what the French call Burgundy, this is your wine! Don’t miss the opportunity to drink this wine. From Anonymous of St Clair Shores, Michigan on 2/12/2019 . This is a great bottle of wine.